The Philadelphia Eagles are continuing to use their on-field success for meaningful causes off the field as they make their way toward the Super Bowl. When kicker Jake Elliott found out his former high school, Lyons Township High School in Illinois, made a t-shirt for him Wednesday morning, he loved it. 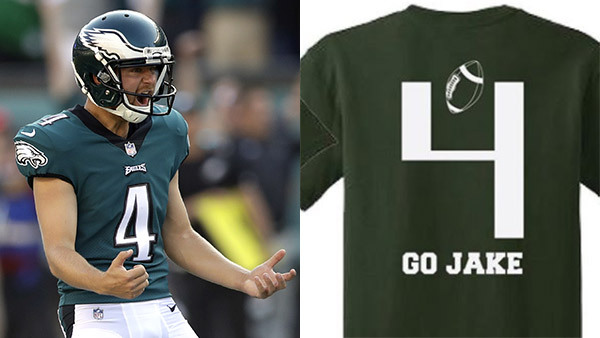 The shirt reads "Fly Eagles Fly" on the front and "Go Jake" on the back, with a football going through a goal post made from his number 4. The shirts were originally only to be available during lunch periods for students for $5. "All proceeds go to the charity of [Jake's] choice," the school posted on Instagram. Elliot was quick to respond with his choice. "Would also love to see all the proceeds stay within the LT community and go toward the @KJOFoundation in love of Kelli "JOY"!" Elliott tweeted. "The Kelli Joy Foundation was established by Kelli's family to keep her memory alive through future education opportunities for young people. Kelli, a member of the class of 2015, was a freshman at Lyons Township when her life was taken by a burglar in her home. Kelli's family and much of the community come together to remember her, celebrate her life and raise money for her memorial fund. The mission of the Kelli Joy O'Laughlin Memorial Fund is to give young people opportunities to develop their greatest potential of friendship, kindness, leadership skills, confidence as well as their education through college scholarships and other charitable activities." Soon, Elliot was getting requests from people who do not attend Lyons Township High School. "Any chance to sell online?" Elliott asked. For those interested in purchasing a shirt, Elliott posted the Twitter handle of the person to contact. But what does this means fans in Philly can get them? 6abc reached out to Lyons Township High School. "We're discussing it. This has gotten much bigger than we ever anticipated! Unlikely that we would be able to get them to Philly in time for the Super Bowl," the school responded. Elliott's t-shirt is not the first this season to make a difference in the community. Right tackle Lane Johnson's 'Home Dogs Gonna Eat' t-shirt has raised more than $10,000 for Philadelphia schools. NFL donating proceeds to Philly schools. Matt O'Donnell reports during Action News Mornings on January 24, 2018. The NFL says all proceeds from their underdog t-shirt will go to The Fund For the School District of Philadelphia.